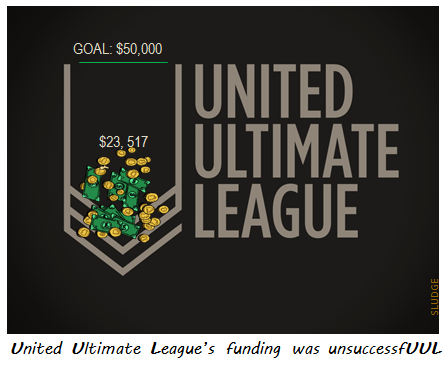 The United Ultimate League's attempt to crowdfund its inaugural season ended yesterday. A total of 449 people donated a total of $23,517 -- well short of its $50,000 goal. As a result, UUL's funding campaign was unsuccessful. 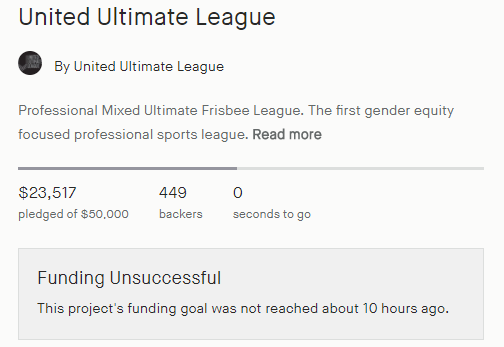 The total amount raised was 47% of its $50,000 goal on Kickstarter, with an average backing of ~$52.37 for what was billed as the first gender equity focused professional sports league. Since this 'Professional Mixed Ultimate Frisbee League' did not reach its goal, the UUL had said: "go back to the drawing board or pass the torch to someone else. We believe that Pro Mixed Ultimate is the future for our sport and hope you think so too." However, UUL's founder, contradicted this plan in an interview with Ultiworld. [Via Ultiworld] Todd Curran: "To be honest, the UUL is going to cease . I’m closing out of all this stuff. I'll still be there if anyone has questions, but we are not going to be moving forward because the community has spoken about the UUL....We tried. We put our best foot forward, the way that we thought the league could be run efficiently and profitably."